We’ve all been to webinars: you sign up or register, then you log in to the webinar site a little before the scheduled time. Then you sit there. The screen displays a generic background, and the text says something like “The webinar will begin at 12:30.” And you sit. Your watch says 12:28. You see nothing new. You hear nothing new. So you leave to check your email or to watch the latest Cats versus Cucumbers video. Then, finally, you hear the webinar start. Those minutes between the time when a student logs in and the time when the event actually starts are wasted potential. For live, instructor-led, online training we can do better than that typical webinar tradition. 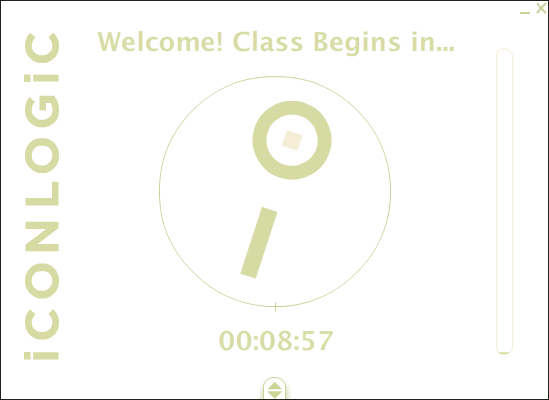 When participants arrive at your classroom, instead of having them stare at a still screen with the start time plastered on it, use a real timer that is counting down to class time. Since the first space launch, a countdown has always generated excitement. Today, on a hot, summer day, in my classroom, at the end of a timer countdown, one of my participants typed in the chat window: “Happy New Year!” A countdown is fun, positive, and in some small way, exciting. Now let’s think about that generic screen background. Sure, you can display your logo and the name of the class. But what about this? Instead of still imagery, you could have a looping slide show providing crucial information to your participants, even as they log in. One slide says “Welcome to the training on Topic X”; another shows a screenshot and says “Here is where you can find your chat window”; another says “Have you downloaded everything you need for the class?” Of course, not all of your participants will log in early, but those who do, will be well prepared for the class. And what about that silent audio time? By the time students start arriving, you should be there to greet them on the audio. But for the really early students? How about a little background music, so that they can tell that their audio is working. Soon, I’m planning on using an animated video to welcome my early arrivers. Previews of coming attractions, anyone? Because having students arrive early is to everyone’s benefit, let’s reward those who log in early with additional information, entertainment, and engagement.